Show everyone that you're 'clearly' meant to be with an unforgettable favor that lasts beyond the hours of your special event. 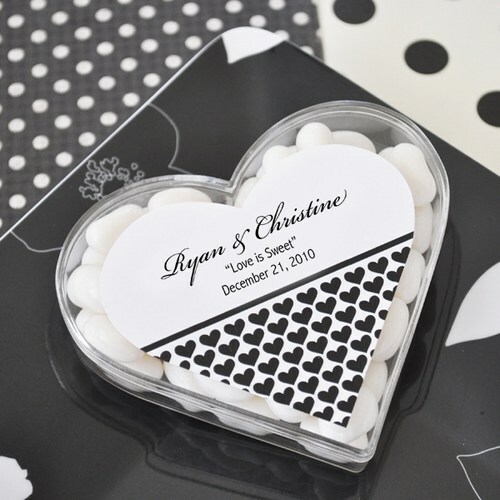 These 'Clearly in Love' Acrylic Heart Boxes make the perfect wedding favor to a wonderful occasion and double as memorable and reusable keepsakes. These carefully moulded heart shaped boxes can be filled with your favorite bite size goodies from candy to nuts and then refilled by your guests' much loved munchies. These versatile trinkets will remind your guests of your wedding day with personalized labels that allow you to add your own message, names, and wedding date for a truly custom wedding favor.